It has often been said that dogs are like people (and vice versa) and for good reason! Just like there are some well-manicured people who “look like a million bucks,” there are some dogs who look like the picture of health– strong, clean and ready for the world. Then there are people and dogs who look like… a mess. Their hair? Rough! Their nails? Too long! Their breath? Yikes– smelly. Why have a well groomed dog? First, you don’t want their hair to get tangled and matted. If you’ve ever seen a dog with matted hair, that’s when it’s clumped together and hard to the touch. Basically, loose hair, debris and skin dander “congeal” of sorts, and the only way to fix it is a good brushing and/or removal via shaving it off. Dogs with “bad hair” that’s a matted mess can end up with bacteria and fungus growths that negatively affect their overall health. You don’t want that. It’s important to take care of a dog’s hair and the skin underneath in order to prevent rashes, skin infections and even…gasp… gangrene. Another reason dogs need good grooming to stay healthy is to prevent problems with their eyes, ears and mouths. Did you know dogs can get scratches on their corneas, ear mites, lose teeth, and other bad problems if they’re not taken care of properly? 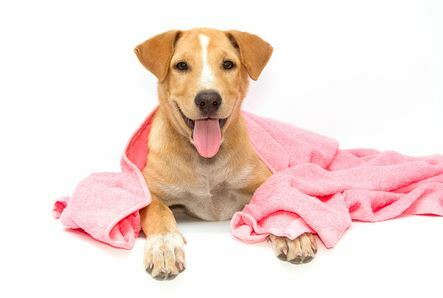 Ideally, dogs need to be kept clean and dry… dirty and wet leads to health problems. Now about nails: overgrown nails are not good for your pet. When nails grow too long and aren’t clipped, guess what: the animal’s toes end up being bent backwards. How awkward is that? As you can imagine, it’s painful for the dog. The longer nails grow, the more likely they are to start curling up… and if left unchecked, they can literally start growing into the bottom of the feet. Please don’t let that happen to your dog. It’s important for dogs to stay well groomed with special attention to their skin, coat, eyes, ears, teeth and paws. Obviously, a dog cannot take care of themselves, so they need their human caregiver to do the necessary jobs for them. Most people don’t know how to care for the “specifics” of a dog, so they leave those jobs to professional groomers. If that sounds like you, then bring your dog to D’Tails Grooming, keeping him or her healthy and happy.